For the past couple of years, Iceland Naturally has brought Icelandic culture to Boston with Taste of Iceland. 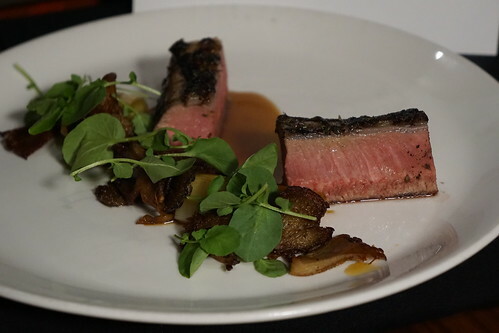 This year, Taste of Iceland is coming back to Boston from March 16-20. The five-day festival brings Nordic cuisine, music, art, film, and literature. The main draw for me, of course, is the food and drinks. This year, they are bringing in Chef Sigurdur Helgason (a.k.a. 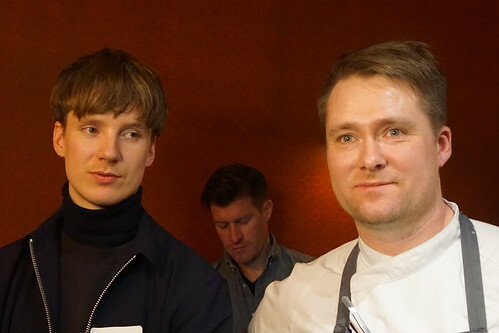 Siggi Helga) of Grillið restaurant to create a four-course Icelandic menu at The Merchant (not to be confused with the MIT mathematician Sigurdur Helgason - not that most of you would). Grillið is located in the Radisson Blu Saga Hotel. This hotel is actually owned by the Icelandic Farmers Association and is also known as Farmers Palace. As you can imagine, the farm-to-table vision is very much alive and well at a place like this. Siggi also represented Iceland in Bocuse d'Or in 2015. Here, he brought many of the Icelandic ingredients for the 4-day stint in Boston. 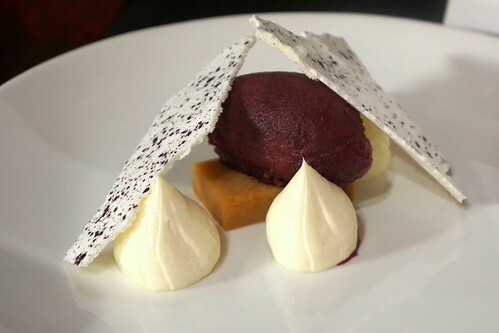 The first course is a "taste of Icelandic nature", composed of three different bites. 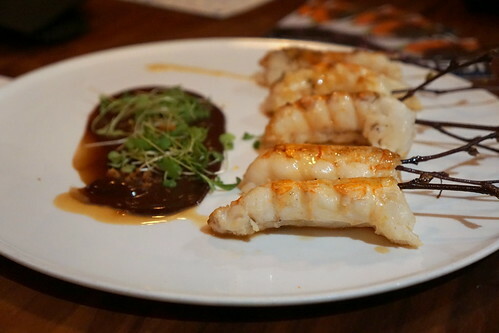 I look forward to a bite of langoustine each year for the Taste of Iceland event. If you've never had Icelandic langoustine, what are you waiting for? 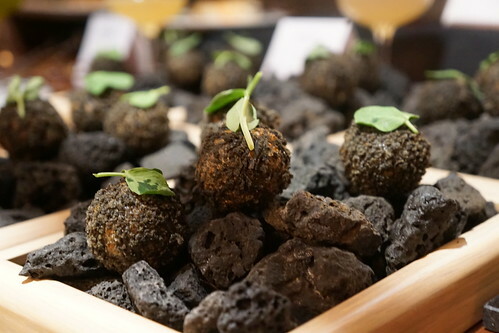 These bites are not only inspired by the flavors in Iceland, but also the landscapes. The Icelandic smoked lamb is quite salty and has a strong flavor, so he uses it primarily as seasoning. 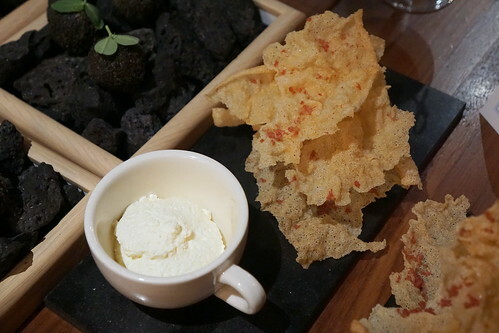 In this dish, it is sprinkled on top of the light, crispy bread with a side of horseradish dip. 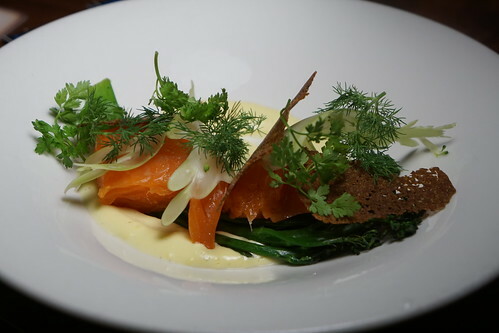 Sea trout is closely related to arctic char, and the flavors definitely reminded me of that. I really enjoyed the texture of the smoked trout. I was told you can't find real skyr here in the US, what's in the market is not the same as the real thing, so it's good that they brought it from Iceland! The crowberry are berries that grow in the northern hemisphere like Alaska, Iceland, Falkland Islands, etc. 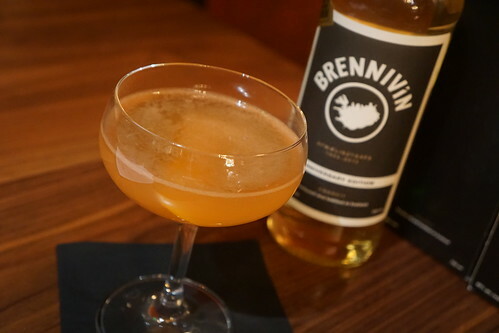 The 2015 Brennivin cocktail champion, Kári Sigurðsson, will be slinging some drinks made with Reyka, the Icelandic vodka, and Brennivin, the signature Icelandic liquor fermented with caraway. 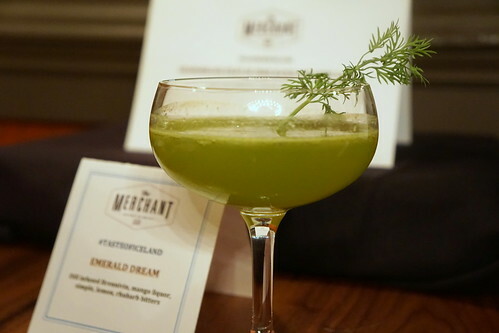 I loved the herbal notes from the dill infusion and the brennivin's caraway flavor itself! This was the drink that won Kári the 2015 Brennivin cocktail championship, when he was only 24 years old. 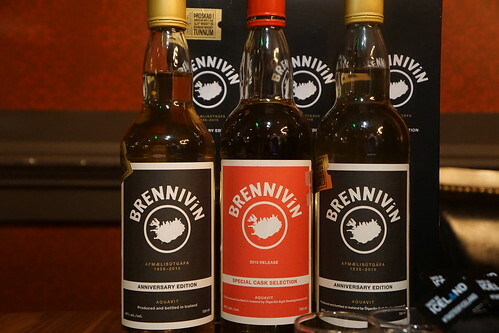 Easy to drink but still complex, this is a good intro to Brennivin. Blue Lagoon (Reyka vodka, pineapple, simple syrup, lime, habanero shrub bitters. Lava salt rim). 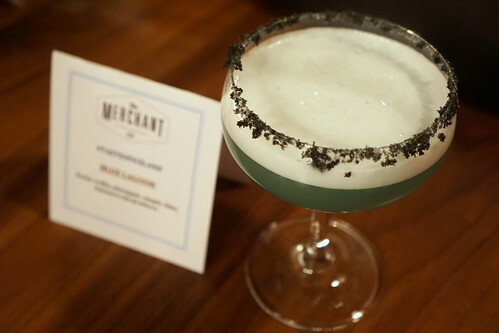 This drink was created by bartender Bryan Ames from The Merchant and has quite a kick to it. I also had the chance to try two special Brennivin, which were very different from the regular Brennivin we know of. The cask selection is a 50-50 blend of Brennivin that's been aged in Oloroso sherry casks in six months and in used bourbon barrels in six months. The Anniversary selection, on the other hand, is consecutively aged for four months in Islay scotch barrels, 4 months in used bourbon barrels, then 4 months in new charred American white oak for a total of a year. Other than the special food and drinks, there is also a FREE concert featuring Icelandic artists will be taking place at The Middle East on March 18. The lineup includes Fufanu and Mammút from Iceland along with Boston's Dirty Dottys. You can go in for free on a first come first serve basis, so go early. Check the full lineup of the Taste of Iceland events here.